Whether she’s wearing a see-through dress in a college charity fashion show or a couture wedding dress to marry her college sweetheart, Catherine Middleton isn’t the type of girl anyone would call common. Likewise, considering the fact that her beau is Prince William of Buckingham Palace rather than a boy named Will from Buckingham Road, there is also nothing common about the girl everyone calls Kate. Yet without a country of her own or a title to her name and in stark contrast to the man who is second in line to the British throne whom she first met on campus ten years before saying “I Do,” as far as the history of the monarchy is concerned, Kate Middleton is a commoner… if only by association. 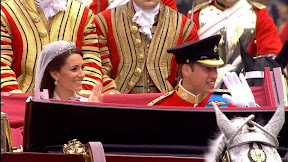 As such and regardless of what Disney fairytales , tween romances and dime store paperbacks would have you believe, the spring 2011 marriage of royal William and (uncommon) commoner Kate marked the first of its kind in more than three hundred and fifty years. With those numbers, it’s no wonder that that many consider the monarchy both outdated and out-of-touch but instead of a revolution, hope for the royal future arrived in the form of love rather than war. And fittingly given his mother’s legacy as “the people’s princess,” it took the eldest son of Charles and Diana to break down the barrier between the stuffy royals and the commoners with a marital celebration that captured global attention on the greatest scale since the funeral of Diana, which had also been held at Westminster Abbey. Likewise, William’s decision to choose a mate on his own for love instead of politics not only reflected the changing times while previewing the new monarchy to come in the new millennium but also presented the world with a courtship and engagement that mirrored our own. 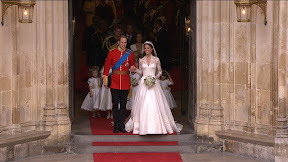 And despite a surprisingly dull commentary of the proceedings by BBC journalists, the projected hope for a better future than the one shared by William’s parents (who incidentally walked down the same Abbey aisle in the unhappily ever after “storybook wedding” thirty years earlier) is certainly felt in the network’s coverage of the Royal Wedding now available on DVD. Yet whereas William does look very serious throughout – perhaps much more acutely understanding to what end the otherwise biggest day of his life is a Palace PR Extravaganza – if Kate is aware of the pressure, she certainly doesn’t show it at all. Visibly radiant in a beautifully timeless, modestly feminine yet traffic-stopping bridal gown designed by Sarah Burton for Alexander McQueen, the commoner looks ever so royal in her debut as the wife of her college sweetheart– laid back, smiling yet as carefree in her appearance as if he’d been Will from Buckingham Road rather than William from Buckingham Palace. Of course, the palace connection does have its perks as evidenced in this gorgeously photographed spectacle complete with sweeping visuals that makes it seem as though the BBC had either collaborated with MI5 in wiring every different height and angle of Westminster Abbey with CCTV or hired aerially trained Cirque du Soleil cast members to get the most magnificent images possible. While some of the journalistic fillers that range from musings on the weather to laughably obvious play-by-play including such hard-hitting insight such as “I’m told that Prince Harry does have the ring with him; he’ll be carrying it to the Abbey in his pocket…” are weak at best, the DVD makes up for BBC’s ho-hum spin on the ceremony with the inclusion of the network’s fascinating 50-minute Royal Engagement documentary. Filling us in on the background of the couple along with their family tree to offer a rich overview of their different socioeconomic backgrounds in an engaging portrait that gives us the story behind the storybook wedding photos, Engagement is as entertaining as it is informative. 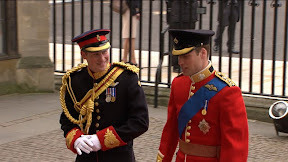 From comparing the impact the relationship had on the monarchy to "a very large dose of Royal Viagra," to sharing anecdotes about Will's college days -- even the famously austere, expressionless palace guards would’ve been tempted to laugh at some of the remarks in the Engagement special. 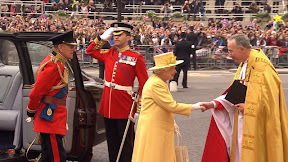 While it's safe to say that the Queen probably preferred the more traditional play-by-play on the big day and Viagra references don't exactly belong on the commentary of a historic wedding, I only wish that the BBC reporters on the scene and in the studio could've gotten into the spirit of the event. 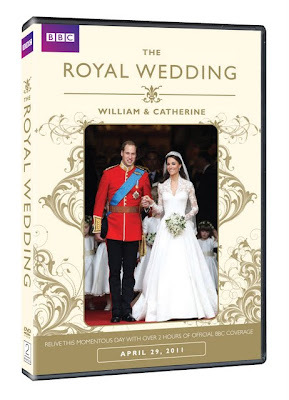 But what it lacks in audible informative charm the DVD more than makes up for in cinematographic beauty as a gorgeous celebration of a royal wedding built on common love.